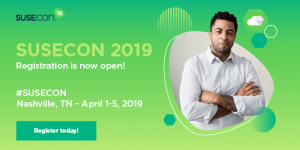 SUSECON 2019: There’s Still Time! Don’t let SUSECON pass you by–you’ll wait a year if you do, and technology doesn’t wait. Join your open source peers in Nashville, get insights on how to maximize your IT infrastructure, and move forward with confidence into the future.